There are a number of important biomolecules that could occur as enantiomers, including amino acids and sugars. In most cases, only one enantiomer occurs (although some fungi, for example, are able to produce mirror-image forms of these compounds). We will look later at some of these biomolecules, but first we will look at a compound that occurs naturally in both enantiomeric forms. Carvone is a secondary metabolite. That means it is a naturally-occurring compound that is not directly connected to the very basic functions of a cell, such as self-replication or the production of energy. The role of secondary metabolites in nature is often difficult to determine. However, these compounds often play roles in self-defense, acting as deterrents against competitor species in a sort of small-scale chemical warfare scenario. They are also frequently used in communications; this role has been studied most extensively among insects, which use lots of compounds to send information to each other. Figure SC5.1. The two naturally-occurring enantiomers of carvone. Carvone is produced in two enantiomeric forms. One of these forms, called (-)-carvone, is found in mint leaves, and it is a principal contributor to the distinctive odor of mint. The other form, (+)-carvone, is found in caraway seeds. This form has a very different smell, and is typically used to flavour rye bread and other Eastern European foods. The structural connectivity in these two compounds appears to be identical, but they aren't the same in three dimensions, as you will find if you build models of them. Instead, (+)- and (-)-carvone are mirror images of each other, like a right hand and a left hand. Figure SC5.2. Ball-and-stick model of (R)-carvone. Go to Animation SC5.1. 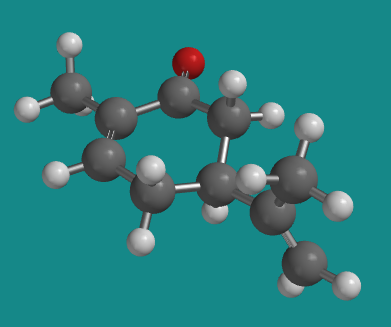 A three-dimensional model of (R)-carvone. Figure SC5.3. Ball-and-stick model of (S)-carvone..
Go to Animation SC5.2. A three-dimensional model of (S)-carvone. Note that (+)-carvone is the same thing as (S)-carvone. The (+) designation is based on its positive optical rotation value, which is experimentally measured. The (S) designation is determined by the Cahn-Ingold-Prelog rules for designating stereochemistry, which deal with looking at the groups attached to a chiral center and assigning priority based on atomic number. However, carvone's chiral center actually has three carbons attached to it; they all have the same atomic number. We need a new rule to break the tie. If two substituent groups have the same atomic number, go one bond further to the next atom. If there is a difference among the second tier of atoms, stop. The group in which you have encountered a higher atomic number gets the highest priority. If there is not a clear difference, proceed one additional bond to the next set of atoms, and so on, until you find a difference. .The chiral center is connected to a H, a C, a C and a C.
The H is lowest priority. One C eventually leads to a C=O. However, at the second bond from the chiral center, this C is connected to a C and two H's. A second C is also part of the six-membered ring, but the C=O is farther away in this direction. At the second bond from the chiral center, this C is connected to a C and two H's, just like the first one. The third C is part of a little three-carbon group attached to the six-membered ring. At the second bond from the chiral center, it is connected to only one H and has two bonds to another C (this is counted as two bonds to C and one to H). Those first two carbon groups are identical so far. However, the third group is different; it has an extra bond to C, whereas the others have an extra bond to H. C has a higher atomic number than H, so this group has higher priority. The second-highest priority is the branch that reaches the oxygen at the third bond from the chiral center. Figure SC5.2. Comparing atoms step-by-step to assign configuration. How different, exactly, are these two compounds, (+)- and (-)-carvone? Are they completely different isomers, with different physical properties? In most ways, the answer is no. These two compounds have the same appearance (colourless oil), the same boiling point (230 ° C), the same refractive index (1.499) and specific gravity (0.965). However, they have optical rotations that are almost exactly opposite values. Two enantiomers have the same physical properties. Enantiomers have opposite optical rotations. Clearly they have different biological properties; since they have slightly different odors, they must fit into slightly different nasal receptors, signaling to the brain whether the person next to you is chewing a stick of gum or a piece of rye bread. This different shape complimentarity is not surprising, just as it isn't surprising that a left hand only fits into a left handed baseball glove and not into a right handed one. There are other reasons that we might concern ourselves with an understanding of enantiomers, apart from dietary and olfactory preferences. Perhaps the most dramatic example of the importance of enantiomers can be found in the case of thalidomide. Thalidomide was a drug commonly prescribed during the 1950's and 1960's in order to alleviate nausea and other symptoms of morning sickness. In fact, only one enantiomer of thalidomide had any therapeutic effect in this regard. The other enantiomer, apart from being therapeutically useless in this application, was subsequently found to be a teratogen, meaning it produces pronounced birth defects. This was obviously not a good thing to prescribe to pregnant women. Workers in the pharmaceutical industry are now much more aware of these kinds of consequences, although of course not all problems with drugs go undetected even through the extensive clinical trials required in the United States. Since the era of thalidomide, however, a tremendous amount of research in the field of synthetic organic chemistry has been devoted to methods of producing only one enantiomer of a useful compound and not the other. This effort probably represents the single biggest aim of synthetic organic chemistry through the last quarter century. Enantiomers may have very different biological properties. Obtaining enantiomerically pure compounds is very important in medicine and the pharmaceutical industry. Problem SC5.1. a) Draw thalidomide and identify the chiral center with an asterisk. b) Draw the two possible enantiomeric forms of thalidomide. Problem SC5.2. Draw the two enantiomeric forms of 2-butanol, CH3CH(OH)CH2CH3. Label their configurations. Problem SC5.3. Sometimes, compounds have many chiral centers in them. For the following compounds, identify four chiral centers in each, mark them with asterisks, and identify each center as R or S configuration. The following is the structure of dysinosin A, a potent thrombin inhibitor that consequently prevents blood clotting. Ginkgolide B (below) is a secondary metabolite of the ginkgo tree, extracts of which are used in Chinese medicine. 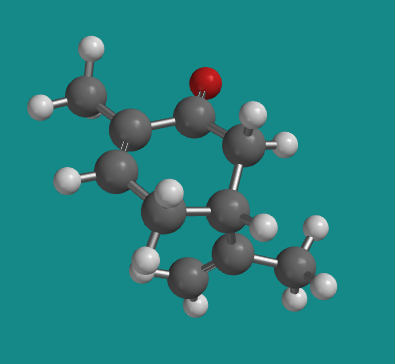 Sanglifehrin A, shown below, is produced by a bacteria that may be found in the soil of coffee plantations in Malawi. It is also a promising candidate for the treatment of organ transplant patients owing to its potent immuno-suppressant activity.